The European Southern Observatory's Very Large Telescope (VLT) observed a gas cloud (named G2) being ripped apart by the supermassive black hole at the center of the Milky Way Galaxy. The VLT data confirm that G2 is now so stretched that the front part of it has passed the closest point and is travelling away from the black hole at more than 10 million km/h, whilst the tail is still falling towards it. The European Southern Observatory's Very Large Telescope (VLT)is observing a gas cloud (G2) being ripped apart as it passes the supermassive black hole at the center of the Milky Way galaxy. A supermassive black hole is the largest type of black hole in the universe with its mass being millions or even billions times that of the Sun. Just recently, a new class of Galaxy-Black Hole System With a mass equal To 11 billion Suns was discovered. It is believed that at each center of a galaxy lies a supermassive black hole. 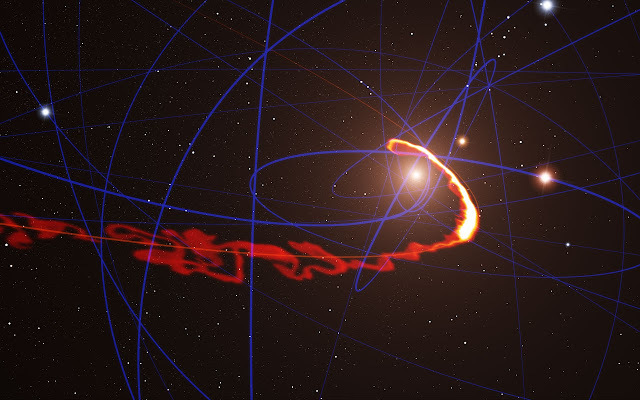 The Milky Way's supermassive black hole is estimated to have a mass of about four million times more than that of the Sun. It is the closest supermassive black hole to the Earth and was created with the collapse of the Sagittarius A star. The study of the supermassive black hole at the centre of the galaxy and its environment is rated number one in the list of ESO's top ten astronomical discoveries. G2 has been observed to be 25 billion kilometers from the black hole itself. Even at this distance, the pull of the black hole is still strong enough to rip apart the gas cloud. The gas at the head of G2 is now stretched over more than 160 billion kilometres around the closest point of the orbit to the black hole. With this observation, the scientists are studying how the gas cloud interacts with the ambient gas surrounding the black hole and so far, nothing has been found. New observations from ESO’s Very Large Telescope show for the first time a gas cloud being ripped apart by the supermassive black hole at the centre of the galaxy. The cloud is now so stretched that its front part has passed the closest point and is travelling away from the black hole at more than 10 million km/h, whilst the tail is still falling towards it. In 2011 ESO's Very Large Telescope (VLT) discovered a gas cloud with several times the mass of the Earth accelerating towards the black hole at the centre of the Milky Way. This cloud is now making its closest approach and new VLT observations show that it is being grossly stretched by the black hole’s extreme gravitational field. "The gas at the head of the cloud is now stretched over more than 160 billion kilometres around the closest point of the orbit to the black hole. And the closest approach is only a bit more than 25 billion kilometres from the black hole itself — barely escaping falling right in," explains Stefan Gillessen (Max Planck Institute for Extraterrestrial Physics, Garching, Germany) who led the observing team. "The cloud is so stretched that the close approach is not a single event but rather a process that extends over a period of at least one year." As the gas cloud is stretched its light gets harder to see. But by staring at the region close to the black hole for more than 20 hours of total exposure time with the SINFONI instrument on the VLT — the deepest exposure of this region ever with an integral field spectrometer — the team was able to measure the velocities of different parts of the cloud as it streaks past the central black hole. "The most exciting thing we now see in the new observations is the head of the cloud coming back towards us at more than 10 million km/h along the orbit — about 1% of the speed of light," adds Reinhard Genzel, leader of the research group that has been studied this region for nearly twenty years. "This means that the front end of the cloud has already made its closest approach to the black hole." The origin of the gas cloud remains mysterious, although there is no shortage of ideas. The new observations narrow down the possibilities. "Like an unfortunate astronaut in a science fiction film, we see that the cloud is now being stretched so much that it resembles spaghetti. This means that it probably doesn’t have a star in it," concludes Gillessen. "At the moment we think that the gas probably came from the stars we see orbiting the black hole." These observations from ESO’s Very Large Telescope, using the SINFONI instrument, show how a gas cloud is being stretched and ripped apart as it passes close to the supermassive black hole at the centre of the galaxy. The horizontal axis shows the extent of the cloud along its orbit and the vertical axis shows the velocities of different parts of the cloud during the last ten years. The cloud is now (2013) dramatically stretched out and the velocity of the front is several million km/h different from that of the tail. The climax of this unique event at the centre of the galaxy is now unfolding and being closely watched by astronomers around the world. This intense observing campaign will provide a wealth of data, not only revealing more about the gas cloud, but also probing the regions close to the black hole that have not been previously studied and the effects of super-strong gravity.